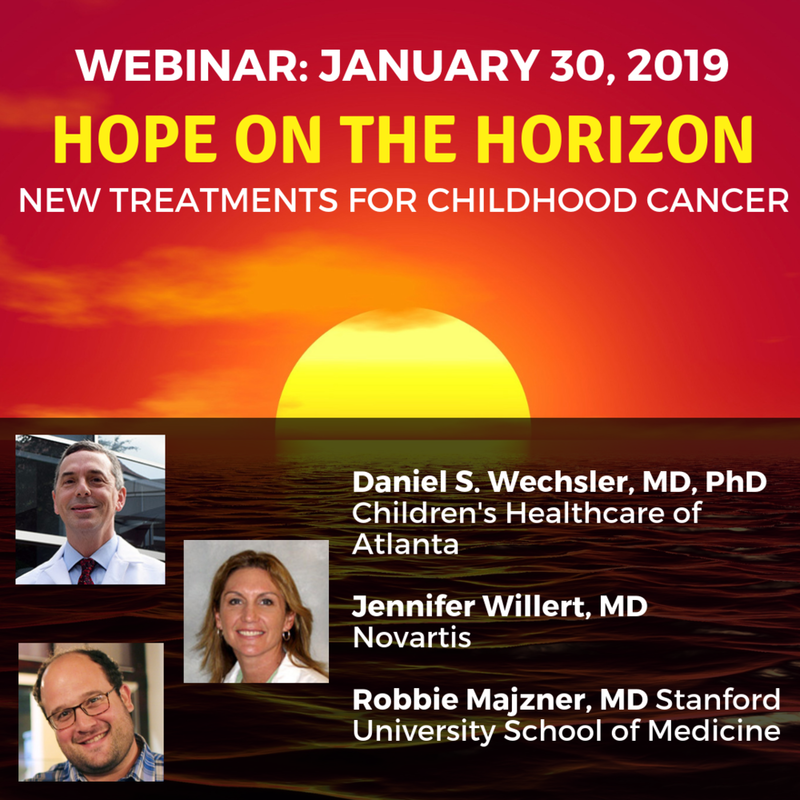 Join us at 3pm Eastern time tomorrow for Hope on the Horizon, a free webinar featuring information about the latest ground-breaking developments in childhood cancer research. We are fortunate to be joined by a pediatric oncologist, a CAR-T researcher, and a pharmaceutical representative. We hope you'll join us for this educational and informational hour. Sign up now. Even if you can't make it at the scheduled time, we encourage anyone interested in this topic to register so you receive the recording afterward. The kick-off of the 116th Congress was overshadowed by the drama of the partial government shutdown, which finally came to a (temporary) end on Friday. If you haven't had a chance yet, we ask that you take a moment to introduce yourself to your Members of Congress and share with them your childhood cancer story. By making these early introductions, you set the stage for ongoing communications with your Member — and make sure they know early on that constituents in their district care deeply about children with cancer and childhood cancer survivors. We’ve made this introduction easy by providing the template and form on our website: take action here. If you have existing relationships with any Member of Congress, please take a moment to let us know. Identifying our advocates with Congressional contacts helps us do better targeted advocacy on key issues that impact kids with cancer. You're invited to join the Children's Cause and the Alliance for Childhood Cancer for the 8th Annual Childhood Cancer Action Days on March 26th and 27th in Washington, D.C.
Issues and advocacy training will be held on Tuesday, March 26th at the Renaissance Arlington Capital View Hotel in Arlington, Virginia. The following day will include pre-arranged meetings with Members of Congress and their staff on Capitol Hill to discuss important childhood cancer issues currently before Congress. The Childhood Cancer STAR Act was signed into law last year. This year, we start to see the real impact of all of our hard work! This Funding Opportunity Announcement (FOA) is directly associated with the STAR Act -- and the Biden Cancer Moonshot Initiative. This FOA requests applications from investigators to develop and test interventions that prevent, mitigate or manage adverse outcomes in pediatric and/or AYA cancer survivors and/or evaluate models of care that strengthen coordination, continuity, and quality, or that reduce access barriers to needed services including follow-up care, and that improve outcomes across the survivor's lifespan. NCI plans to provide a $4.8 million total annual set aside for the RFA ($25M 5-year total). The RFA includes two receipt dates, March 2019 and January 2020. Additionally, NCI is exploring opportunities for a future program announcement that will continue to promote areas highlighted in the STAR Act and solicit both observational and intervention studies to address the full spectrum of research priorities in pediatric/AYA cancer survivors. The Children's Cause will begin accepting applications for our 2019 College Scholars Program in early February. If you or someone you know may be interested in applying, fill out our interest form to be the first to know when the application is available. Our College Scholars Program is an annual opportunity for two childhood cancer survivors to gain valuable cancer advocacy experience. Award recipients will receive an academic scholarship of $2,000 for Fall 2019. Through January 31, 2019, AmazonSmile will donate 15% the purchase price of new print magazine subscriptions to your charity of choice, a significantly higher percentage than the typical 0.5% that we receive from AmazonSmile purchases! It's tax time: Do you need documentation? If you need a tax receipt for your 2018 donations to the Children's Cause, please contact Charlcie Steuble at csteuble@childrenscause.org.